Display your dress – wedding dresses are not for one day only! The wedding dress epitomises what a wedding is all about. The day itself – stylish, glamourous, and perfect – should be summarised in just one garment. But they are so beautiful that they shouldn’t just be put away, never to see the light of day again. I’ve got to come clean here. I’ve never worn a wedding dress. I’ve never even worn a dress (well, maybe once, but it’s a long story, best forgotten), but that’s because I’m a man. So I have no idea just how it feels to choose and wear such a garment. However I do know it is something which all women absolutely love to do. What I can do is offer the male perspective on wedding dresses: we do notice them and we do make a judgement. I have seen lots of wedding dresses. I’m lucky in that I go to many weddings, as I own a mobile creperie which is often hired for wedding catering. And in all honesty, I have never seen a bad wedding dress. I’ve only ever seen beautiful ones. We have heard of a bride wearing a red wedding dress. We never witnessed it and it does sound a bit dubious and probably would look pretty horrible. The ones we have seen have always been white or ivory. It’s funny how many brides opt for a white chocolate Milky Bar crêpe at their evening reception. I often wonder if it’s a sub-conscious “white wedding” thing. A proper wedding dress has to be white. As a wedding is a unique occasion, it is right that the dress is designed to be worn “once only” – if it was worn more often, then it would lose it’s magic and the unique feel which accompanies it. It’s the most expensive item of clothing you will ever buy, and you will only wear it for one day. It’s a way of permanently displaying and admiring the dress from the biggest day of your life. Why would you want to put it in a box and stick it in the loft when you can hang it on a wall? The bouquet and other keepsakes from the day can be included, acting as a permanent reminder and summary of your wedding. 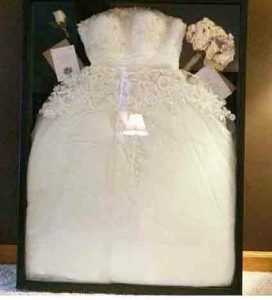 Any competent picture framer could make a box frame to display your wedding dress and it would be inexpensive – for just a small amount on top of your wedding budget, you can gain much greater, long-lasting value from the most symbolic item of your wedding and tap into that feeling again, just by looking at it.